SPIRAL Collective in-clinic volunteers and TAP volunteers please join us to chat and check-in. How is it going in clinic? Is there anything you want to talk about with other SPIRAL in-clinic and TAP Volunteers? 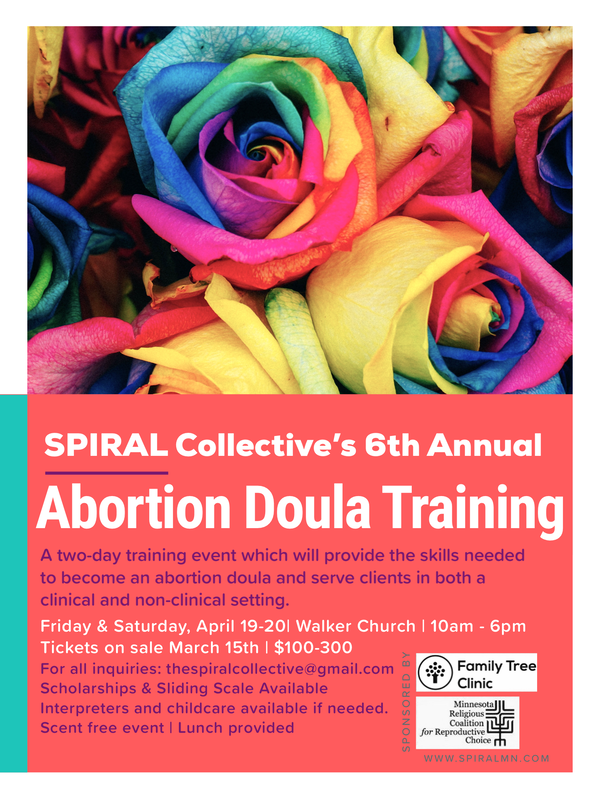 A 2-day training which will provide the skills needed to become an abortion doula and serve clients in both a clinical and non-clinical setting. Anyone interested in providing abortion doula services is welcome, no experience necessary. The SPIRAL Collective is reserving scholarships - on a case by case basis - for queer and trans folks, folks with disabilities, people of color and anyone else from a marginalized community. We acknowledge the importance of amplifying the voices of folks from these communities and are committed to making our training accessible.